The “America and France” that Mr. Ignatius called on to motivate Syrians to rebel against their government was actually a group of westerners residing in Damascus: Diplomats, NGO management and staff, resident journalists and professional photographers, students studying Arabic in Damascus. Not all of course, but many. Pressure/destabilization targets; Syria, and Iran. If Syria’s authoritarian leadership (“regime”) had an inherent propensity to distrust the intentions of resident foreigners eager to befriend Syrians, their extensive experience with the consequences of such contacts turned their caution into paranoia. They would question or detain anyone who travels to attend private meetings, workshops or conferences without prior arrangements with the Syrian security services. Syrians who frequently visited foreign embassies in Damascus (4thof July events, dinners at Ambassador’s house …etc.) were never trusted again. Was that paranoia misplaced? … In some cases it was and patriotic, decent Syrians were unfairly punished. But there were also many valid reasons to be concerned. Sectarians who hate Iran, Hezbollah and the Alawites. These include liberals who are willing to work with Islamist militias, or to turn Syria into a Turkish province if it means defeating Iran/HA and removing the Alawites from power. Narcissists who feel their government in Syria failed to do enough to serve their personal needs, or failed to recognize their brilliance and to promote them accordingly. Also includes those with an inflated sense of their personal power and ability to change their country (to their liking). Those seeking revenge for an offense (real, exaggerated, or even assumed but not proven) by their government against them, their relatives or some group that they belong to (regional, ethnic or sectarian). In the Middle East, desire for revenge lasts decades. Parents teach their children to never forget. Ambitious self-promoters, … including aspiring artists or novelists. You can count on their loyalty if you can help them shine. Elitists from prominent and affluent families who feel entitled to their country’s leadership because of their family name. Note that at the same types will frequently express their contempt to the current “family rule” in Syria. Those who express high admiration for the west and who value being associated with it or compatible with its values and culture (including “human rights” and “democracy”). These tend to also despise their backward countries and to tell all their friends that they can’t wait to leave because they deserve better. Greedy opportunists who would take money and gladly offer any service in return. Journalists, political science analysts and academics, civil society specialists … they need to earn a living. Only if they join the right side would they be employed or funded. Those who are easily manipulated: … The Naïve and the inexperienced. Millennials and radicals … young and restless and always frustrated that things are not changing fast enough. If the genie grants them just one wish, they will ask for a revolution. Islamists (aka “moderate Islamists”) … where moderation is only a convenient excuse for them and the Americans to do (anti regime) business together. Risk seekers … those with low risk-aversion. Friends of America’s favorite allies: Saudi Arabia and Israel. I encourage any skeptic to quickly think of any five Syrian opposition figures (or activists) who are working for/with the United States on regime change in Syria, then to (honestly) prove that they do NOT belong to any of the mostly unflattering traits/groups I listed above. In my life, I have almost always been on the side of active foreign policy. But you need to know with whom you are cooperating. You need reliable partners — and I don’t see any in [the Syrian] conflict.. The Middle East has been trapped for decades between repressive dictatorships and illiberal opposition groups … The dictators try to shut down all opposition movements, and the ones that survive are vengeful, religious and violent. The point I am hoping to make here is the following: With such an awful collection of “friends”, the United States might manage to topple governments and destroy countries, but it will not be able to rebuild them. It will also never appeal to millions of Syrians who see the United States through the “quality” of its Syrian friends. The Syrian cast of opposition stars that played leading roles in the final sequel of the Arab Spring pentalogy (Tunisia, Egypt, Libya, Yemen, and Syria) deserve credit for managing to turn the classic cliche revolution script: “Olive branch carrying peaceful protesters defeat their dictator”, into a totally unpredictable black comedy. On day 1, there was opposition hero (former political prisoner) Mamoun Homsi dressed in indispensable orange revolution T-shirt … But he was screaming and trying to give the impression he was crying. He was also surrounded with religious symbols and clearly addressing Syria’s Sunnis exclusively. Then there was London-based “human rights activist” Ali Al-Ahmad (member in the SNC, considered “the sole representative of the Syrian people” by the US and its friends). He was on every major TV program from the BBC, to Al-Arabiya to Aljazeera calling for freedom and respect for human rights. Some of us remember his lovely post in 2010 (before the Syrian conflict started) calling on God to wipe out millions of Alawites … and to kill every Alawite child so that none of them can tell the world about what happened to them. On his blog you can also read his other democratic thoughts … like where he wrote “People of Aleppo are as as bad as the Alawites“. Aleppo, Syria’s largest city, was despised by many revolutionaries because it mostly abstained from revolting against President Assad’s government. And of course there was the ultra charismatic Shaikh Adnan Al-Arour best known for his trademark surprise rise and scream that he performs on every TV show of his. He was for 2011 and much of 2012 the most popular leader of the revolution. Among his memorable lines: “Let 100,000 die in Aleppo, why not? big funerals are good for our revolution”. And: We will throw Alawites who support Assad into the meat grinder. The revolution fed on blood. And when there was a slow week with not enough real bloodshed, they created their own, empty coffin, funerals and cried the victims on Aljazeera. They joined funerals of people who died of natural causes and started chanting slogans against the regime that kills its own people (many references available upon request). Then … “the Free Syrian Army” showed up. At first there weren’t many defectors. The same military uniform was used by various alleged defectors appearing in different videos (see here). But eventually they became a real rebel army (or hundreds of little armies) that were given every possible ancient Islamist name anyone could think of, … and a couple of more modern names: “King Abdullah Brigade” and “the Rafiq Hariri Brigade”. Eventually someone, somewhere realized that these names are not 110% politically correct as they challenged the authenticity of the revolution’s slogans like: “the Syrian people are one”. A group of “free Syrians” addressed this problem by producing this FSA video allegedly showing one of many Christian brigades. A dozen over-sized crosses were on display, … to silence any skeptic. Another video was released to revolution supporters claiming that Syria’s Armenians now joining the FSA. The video featured “Artino Abu Aram” speaking on behalf of his heroic Armenian rebel group that appeared targeting Damascus with mortars. To instil fear in Bashar Assad’s heart, a video showing a secret FSA special operations unit appeared on YouTube. A curator at a British arms museum later told the New York Times that the rebels in that video were holding TD-2007 Chinese-made toy replicas of the MP-5 submachine gun, marketed as appropriate for children above the age of 5. To each, the men had affixed an extension — perhaps a painted dowel or a section of pipe — masquerading as a long barrel. The Free Syrian Army brand needed a spokesman. So they experimented with a few. All of them were loud and very original. Dozens of popular Saudi, Kuwaiti, and Egyptian preachers were on TV 24/7 telling their followers in Syria (and elsewhere) that they are fighting God’s greatest fight معركة دابق و عودة الخلافة. They told them that it is ok if 30% of ٍSyria’s population dies. They told them that Sunnis must form an alliance with the US and Europe (عهد بين المسلمين و الروم) that will fight and defeat the Shia and Alawites. After they jointly achieve victory, Sunni forces will promptly kill all those westerners. Was it the United States that “hired” these weirdos to play? Not exactly. The Syrian revolution was initially a Qatari/Turkish (and French) project, until Saudi Arabia joined and competed for the leadership role. Ausama Munajed who had lunch with President Bush in 2008 says he is the founder of Barada TV which for many years before the Arab Spring, was being financed by the United States. The TV station was run by Syrian exiles in Europe who founded the Movement for Justice and Development. U.S. cables describe its leaders as “liberal, moderate Islamists” who are former members of the Muslim Brotherhood. These “liberal Islamists” got six million dollars from the United States government (well, through “the democracy council”). Many would not accept such bluntly demeaning direct cash payments but wouldn’t mind if there was a pretend-I-am-paid-for-my-skills option. The Saudis pay handsomely for opinion pieces published in their Asharq Alawsat and Al-Hayat for example. American and European think tanks, or democracy and human rights organizations hired many Syrian opposition supporters. The UN did the same. This is the polite way to buy loyalty of Syrians who can help in regime toppling and who might be leading their country (after the regime collapses … ). But contrary to what many Syrian government supporters believe, money is not the only motivational tool. Many who didn’t take any money from anyone were attracted to the revolution because they got recognition that they badly needed: Artists got their shows promoted … aspiring authors got international awards for their mediocre books, inexperienced and unqualified figures got invited to Swiss and other conferences (as “opposition”)… Those seeking U.S. citizenship got it … some got honored by being listed in President George W. Bush’s “Freedom collection” … young bloggers were for years (before and after 2011) invited to training seminars and stayed in touch with Natan Sharansky’s cyberdissidents.org (Natan is an Israeli hardline politician) and other western organizations that would teach them how to bring freedom to their countries. This included courses in human rights, citizen-journalism, civil disobedience … and also included (by design, I am sure) a serious dose of ego-boost that would make them love the whole experience even more. 3D democracy games, other fun games and tactics from Canvas/Otpor’s playbookwere shared with joyous young Syrians (and Egyptians and Tunisians …) who couldn’t wait for the day they got to try them back home where they at once laughed at the police and admired their own brilliance (imagining they invented those tactics). Revolution/democracy specialists taught them how to bankrupt their country … but they described it as “bankrupt the regime” to make it less obvious how repulsive and criminal that was. Thanks to western sanctions and to revolutionaries’ “non-violent” activism by now many people in Syria are getting sick or dying from the cold, lack of proper medical care, and from food shortages. The Syrian government cannot afford anymore to subsidize heating oil and other basic foods, like it used to before 2011. The state used to spend $8 billion per year on essential subsidies. Young revolutionaries loved the idea, and they worked on multiple campaigns to call on their friends to not travel on Syrian airlines … Not to deposit money in Syrian banks … to try to devaluate the Syrian pound … to boycott school … to force factory owners to close them … to close stores … to close schools and universities … to throw state-subsidized bread in the garbage/river. A few months after the regime toppling (“revolution”) started, a long list of sanctions was implemented, but western organizations and governments worried it might not lead to the desired results as Syria’s foreign reserves were estimated at $18 billion. Meetings took place where western organizations and officials were present focused on this question: How long will it take before Syria goes bankrupt? Through generous financial rewards and/or constant ego inflation and until recently, no criticism, the United States and its “international community” allies manipulated/spoiled their Syrian clients to the point where they now live in deep delusion. Government opponents grew to realize that no matter what they said or did, the world (or “the international community”) approved. Each thought of himself or herself as a power center, an outstanding intellectual, or simply a national hero. Very few had the patience to work as part of a group, they all wanted to be leaders. Not only that, but they were constantly brainwashed by outside powers (U.S. included) into thinking they are about to win … that the dictator’s days are numbered. 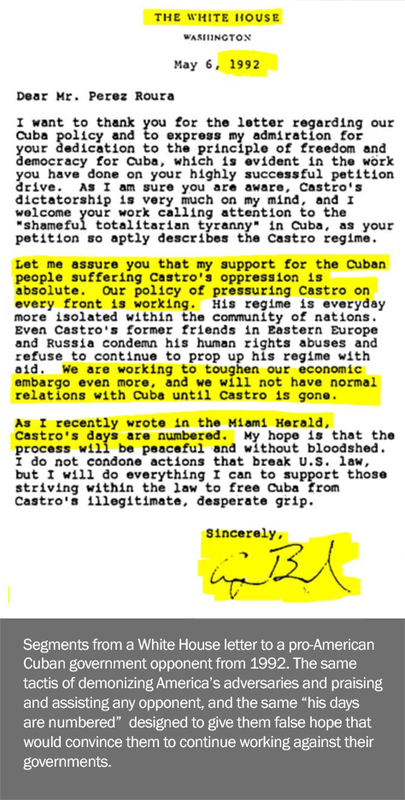 Please take a look at this 1992 White House letter to a Cuban opponent of Castro who, like Syrian opposition, has been seeking more American sanctions on his country, and like Syrian opposition, has been promised by his American friends that … Castro’s days are numbered. Note: This article originally appeared as part of a longer article on Syrian American relations. Criticism here, exclusive to opposition, does not imply praise to the leadership in Syria which often suffers from similar unfortunate traits.